The Shivoham process revealed by Swamiji in the Inner Awakening was the most mystical one yet. It is all about lines and sounds. Swamiji explained that people’s bio memory and muscle memory are made of visualizations and verbalizations, and chaos in these are the cause for all suffering. 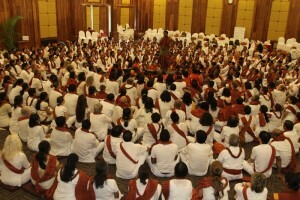 Through the process, Swamiji aligns everyone’s bio- and muscle-memory to the fundamental lines and sounds of the cosmos. Using His energy, He surgically removes the chaotic lines and sounds from everyone – leaving the participants in the space of Shivoham. 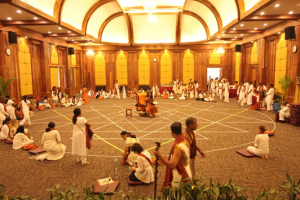 The participants sit in the shape of special yantras (fundamental shapes that represent fundamental energies in the cosmos) and Swamiji chants powerful mantras (fundamental sounds with specific powers of the cosmos) for the participants to experience the powerful space of Shivoham.